The reality is that the middle market is where most American’s fall: 50 million households to be exact. Many of those are uninsured or underinsured, and that represents a tremendous opportunity for insurers to develop solutions to capture and profitably serve this market opportunity. Some estimates say those households in the mid-market represent $12 trillion in potential sales. Able to launch products quickly. 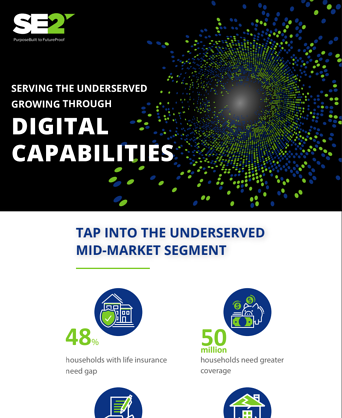 Download our infographic to learn how SE2’s Digital Direct Life can help you digitize end-to-end, offer scale and provide flexible architecture to serve the underserved mid-market.